1. Place the coconut and coconut oil in a food processor, and blitz for about 1-2 minutes. Then add the honey, vanilla essence and milk, and continue to blend in the processor until the mixture has formed a thick mouldable paste. 2. Tip the mixture onto a board and divide into 12 equally sized portions, then roll each into a ball 3-4cm in diameter. Place the coconut balls onto a backing parchment-lined tray and chill in the fridge for about a hour, or until firm. 3. Meanwhile, put the chocolate in a small glass bowl and place over a pan of simmering water until just melted. Remove from the heat and set aside. 4. 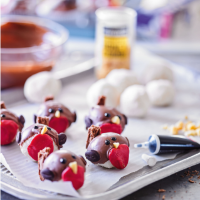 To decorate, roll out small rounds of the red icing and apply to one side of each ball. Have a tray lined with greaseproof paper ready on the side, then carefully hold the ball on either side of the red disc and dip it into the melted chocolate to coat it, but leaving the red disc and a little white on either side exposed. Place on the prepared tray. Then, with clean hands, insert a small piece of honeycomb above the red disc for the beak. Cut the Flake into 2cm lengths and break lengthways into pieces suitable for the tail. Dip into the melted chocolate and fix onto the back of the ball towards the base for a tail. Finally fix 2 chocolate beans at an angle, one on each side of the ball, to act as the wings. Return to the greaseproof tray and leave to harden. Repeat with the remaining coconut balls. 5. Finally, pipe 2 dots of black food colour on each ball as eyes just above the beak. Leave in the fridge until the chocolate and icing has completely set before serving. Cook's tipAs an alternative to robins, make snowballs by rolling the balls in desiccated coconut at the end of step 2, then chilling in the fridge.